Looking back on your childhood there are certain movies that stand out. Depending on who you are and what genre you are into those movies vary person to person. For some its movies like Star Wars, Tron, E.T., etc. but for others there are animated features that are near and dear to our hearts. One in particular that is very well known is the Disney classic Alice in Wonderland. Based on the books by Lewis Carroll the story follows a young girl named Alice who is spending a lovely spring afternoon with her tutor who is giving her a lesson in history. Bored by the narrow and straightforward way in which the lesson is going Alice wishes for a world where nonsense and idiocy are the norm because at the time, to her, that is more entertaining than anything her tutor can offer. All of a sudden a white rabbit dressed in robes and crying how he is "late for an important date" goes running past Alice. Given that animals can't speak Alice runs after the rabbit to try and deduce this mystery. In her rush to corner the rabbit she falls down a hole and enters a world unlike anything she could ever dream; a literal "wonderland" where anything that normally wouldn't make sense, does. As she attempts to hunt down the white rabbit she encounters on her journey an eccentric group of locals all of whom only succeed in delaying her. The more she wanders and the deeper into this world she ventures, the more she realizes that she doesn't like this world as much as she thought she would. At this point she is ready to give up her search for the white rabbit and return to her own world but before she can go home she has one final encounter with the most frightening and lunatic of all the denizens of Wonderland, the Red Queen. The film was adapted from the novel by Disney so while there still remains an element of fear within it never ventures into too dark of a realm for children. Over the years the movie has garnered news fans that have come to appreciate it as much as those who saw it when it was originally released. Now Disney has transferred it to Blu-ray. Being that the film was originally made before the advents of today's technology there isn't too much difference between what we saw then and now. There is crispness to the picture and certainly no crackle to the audio quality but other than that there isn't much more to see or hear. 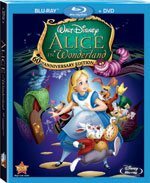 With the film come a slew of extras on two discs such as: A companion's guide to wonderland, an interactive game, enhanced view experience, Walt Disney introduction and some reference footage, and some pencil tests of Alice shrinking. Over on Disc two you have the standard version of the film and some deleted scenes. Alice in Wonderland remains to this day an excellent tale that holds up to the movies of today; delivering wonderful artwork and superb animation while giving the audience a story that is not only fun but has a moral at the same time. Download Alice In Wonderland from the iTunes Store in Digial HD. For more information about Alice In Wonderland visit the FlickDirect Movie Database.